Outstanding inventions in IT, health, sciences, technologies and environment have been honoured at the Vietnamese Talents Awards 2016 on Saturday evening in the capital city. Deputy Prime Minister Vuong Dinh Hue presented first prize for Applied Products on Mobile Devices category to the Monkey Junior by Early Start Company. The first awards presented at the ceremony were to promote talents proposed by the Vietnam Study Promotion Association. The awards aimed to encourage individual study and research to create products that benefit society. The two first prizes, each worth VND100 million, were awarded to applied products in the Mobile Devices category. One award went to Monkey Junior by Early Start Company. This is a foreign language teaching programme for four to ten-year-old children, which includes a large audio-visual collection. The second award went to SMCC - the semantic analysis system and social networks interactive management by InfoRe JSC. The system will collect and analyse information on social networks. It has all the functions of software as a service, and offers a deep learning technology to understand Vietnamese texts. A second prize was also presented to Tripi.vn – Vietnam’s first tourism trading floor by the Tourism Technology Development Joint Stock Company. Tripi uses data to automatically recommend tourism packages for customers. The other winner was MobilePOS by Vietnam mPOS Technology JSC, the mobile phone application which enables businesses to effectively accept credit and debit card payments at all banks in Vietnam. Two third-placed finishers recognized for their comprehensive solutions for surveillance cameras included VP9 Vietnam JSC. The cameras can provide clear images for onsite security surveillance, along with monitoring networks for agriculture and fisheries by Farmtech Vietnam Company. Networking technologies are used to compile data from various locations. The promising start-up award worth VND30 million was presented to the Hachi-Smart Agriculture project. This is a smart hydroponic system which uses LED lighting and smart sensors via mobile phones in urban agriculture. In the medical field, Minister of Health Nguyen Thi Kim Tien presented the second prize worth VND50m to the research and application of new techniques in colorectal cancer surgery by a group of scientists at Hue Central Hospital. The first prize in medicine, worth VND100 million, was presented for the research and application of stem cells in the treatment of blood diseases to a group led by Professor Nguyen Anh Tri, head of the National Institute of Haematology and Blood Transfusion. 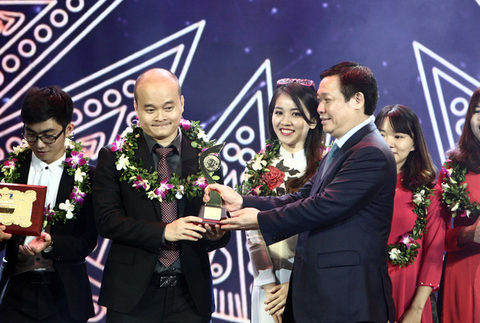 "The Vietnamese Talent Awards were first held in 2005 to honour inventions in IT and then expanded to many other fields, including health, sciences and technologies, environment, and talent promotion," said Bui Huy Hoan, head of the organising board.